The National Health Protection Scheme (NHPS) announced in the Union Budget 2018 has two important components. One, helping the hundred million poor and vulnerable families burdened with hospitalization bill with a coverage limit Rs. 5 lakh per family, two, to trigger the private investments towards those areas and those services for which currently there are no providers or few providers by purchasing their services through NHPS. Any public effort towards providing free (or insurance protected) healthcare access to poor and vulnerable section of the society is a welcome step, but one needs to understand the emerging challenges of insurance-based financing system which would do more damage than gain. It is well documented that in insurance-based system every individual agent (the provider, insurer and patient)try to maximize their own gains like the prescription of unnecessary testing/procedures by provider, low claim-settlement by insurers, while patients sidetrack/postpone primary care treatments and wait until serious illness especially to receive benefit of insurance card meant for hospitalization expenses only. In this process, they compromise on their health front. Figure-1 shows the tendency of low/postponement of hospitalization for primary care among insurance (RSBY) cardholders, while high reporting for hospitalization among them for major morbidity as compared to their other eligible counterparts. 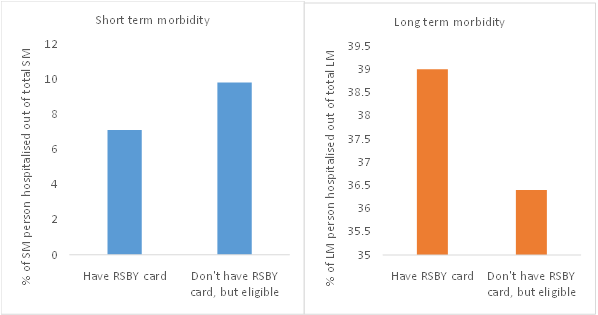 The insurance-based system invite moral hazard problem and/or corruption, like, one can see high(over 40%) hospitalization reporting among RSBY cardholders around the months when RSBY card is about to expire, while such hospitalization reporting is less than 20 percent among other person eligible for RSBY but do not possess RSBY card (Figure 2). On the effectiveness, both national and state level evidences reveal that insurance-based system has not been successful in reducing the out-of-pocket burden from the households.Unfortunately, after the implementation of pro-poor insurance schemes, per person monthly OOP of the poorest quintiles households increased from ₹9.5 in 2000 to ₹75.9 in 2012, which has become almost equal to the richest quintile groups whose expenditure ranges ₹75.8 to ₹83 in the same period (Figure-3). A systemic review of literature of various states and central funded health insurance reveal that out of total 49 review studies, a majority of them (45 studies) concluded that insurance-based system has not been effective in reducing OOP health payment burden, rather OOP of uninsured noticed to be lower than those having insurance protection. Another important assumption is that insurance prompted ‘strategic purchasing’ would play a stewardship role in directing the private investment towards those areas where there are no providers or few providers. The evidences from Census 2011, however, reveals that of the total 1272142 private inpatient healthcare providers, 91.3% were concentrated in metropolitan cities and few districts of urban areas. Experience shows that majority of the private hospitals empanelled under RSBY (65% of the total 12601 hospitals) were concentrated again in few districts. The private sector exist more in number where public facility already exist, as they see market opportunity rather than serving the people of remotest areas. Second, there is considerable debate on setting up of coverage limit Rs. 5 lakh per family. This is a massive hike - almost 17 times higher than the existing limit (Rs. 30k) under RSBY. We estimated that this hike has hardly any economic rational. As per estimates from NSS-2014,an estimated 4,95,85,711 person have had positive expenditure (excluding indirect) on hospitalization, of which 88.6% had expenditure less than equal to Rs. 30k and 98% has hospital bill less than Rs. 1 lakh, indicating 98% of hospitalization expenditure demand could have been met by setting up of Rs.1 lakh coverage limit. The policy on increasing coverage should have taken cognizance of such evidences. The massive hike in coverage would have serious financial implications, as government has to pay the premium based on the increased coverage limit. From the existing national and state level schemes, one interesting observation that we have noticed that the premium for RSBY has increased to more than double in last 5-6 years from less than Rs.300 per family to more than Rs.600-Rs.800 per family for coverage of Rs. 30k. It has increased from Rs.600 to Rs.1200 per family in Rajasthan in last few years for coverage of Rs.30k-Rs.3 lakh. Interestingly, during the period, neither the coverage limit nor the targeted families increased, rather it declined – as some states have withdrawn RSBY. It is important to note that the hospitalization rate (HR) and service cost has increased. For instance, the HR is marked 7% under RSBY as against around 2% at aggregate level. Average HR among RSBY holders is high around 18% in Kerala and Chhattisgarh and as high as 73.9% in Raipur district of Chhattisgarh, where insurance companies are incurring net losses. This is being cited to seek higher premium in other states as well. The rise in premium and cost under RSBY have resulted in high financial burden to the government with an increase in budget allocation from Rs.550 crore in 2014-2015, Rs.724 crore in 2016-17, Rs.1,000 crore in 2017-18 and Rs.2000 crore in 2018-19, even without enrolling all the eligible targeted poor families under the scheme. Moreover, as in the case of Andhra Pradesh empanelled hospitals asked to increase the coverage limit because of increase in price of services. So, after the implementation of insurance-based financing system, the price of services has increased and became costlier for patients. On the proposed premium Rs.1000-Rs.1200 per family under NHPS by the government, the past experience reveals that this proposed premium amount (Rs. 12000 crore annually) would not be enough. For instance, as per estimates from NSS-2014, hospitalization bill of patients belongings to lowest two income quintiles (40%) population, which NHPS is expected to cover, was around Rs.14960 crore and after adjusting for inflation it come around Rs.18496 crore in 2017-18.Ideally, the insurer has to reimburse this hospital bill. This is significantly higher than the calculated proposed premium cost Rs. 12000 crore. Note that these estimates represent the non-NHPS scenario where coverage limit is less than Rs.5 lakh. With the increase in coverage limit, the average cost and hospital bill (as experienced not only the service cost increased but cost of poor has become almost equivalent to higher income quintiles under RSBY) will touch a new high level. After taking cost equalization criteria into account, estimated hospitalization bill of individuals having expenditure less than 5 lakh is Rs.75440 crore, which is 6.29 times higher than the proposed Rs.12000 crore premium, indicating premium is going to cost the government much higher. An ideally assumed level of premium say Rs.2000 per family, would alone consume 37.9% of funds that are allocated (₹52800) to the Ministry of Health and Family Welfare in the current budget. Therefore doubling the premium amount in 3-5 years as it happened in RSBY in Rajasthan, this alone would account more than three-fourth of the budget allocated to health by the central government. The basic premises of insurance theory is that (social) insurance generally pool resources from public sources and contributions from employers and beneficiaries, but contribution from employers in India would be almost negligible because of informal nature of the economy (around 93% of the work-force is employed in the informal sector which leave no/little room to receive employers contribution). It would be impossible to receive contribution from beneficiaries, because of inability to pay. Thus, financing care though insurance-based model in India is almost entirely from public sources. Therefore, with this proposal, the government has to earmark contributions from tax a separate financing from provision. 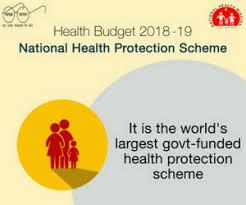 Now, the benefit packages (treatments and procedures) will determine the resource allocation towards the sector.If overall budget allocation towards health do not get substantial increment, as Indian health sector has not received adequate priority in budget historically, this would compel the government to reallocate the health budget from provisioning to insurance financing in the coming years.In this case, one can expect the collapse of already underfunded public healthcare system. Second, the outpatient care is the largest source of OOP with 63% share, under the increasing service cost scenario if public system do not meet demand of general population; the next level of argument would be to cover outpatient care under NHPS. The fragile condition of public healthcare system would not be able to cover all sections of society under NHPS umbrella meeting their hospitalization requirement as well as outpatient demand. This is real political economy problem, which would be highly difficult for the government to address. Further, this kind of changes will bring a fundamental transformation in the existing healthcare system where entire rule of game will change in favor of private players. The government’s role would be limited to provide financial protection through insurance. This changing nature of budgetary priority will minimize the decision-making powers of government on financing, management,operation and establishing a robust healthcare system through budgetary provisions. Under the emerging system, insured person would have a legal entitlement to receive benefits specified in the benefit packages, means money would follow patient and providers have to attract patients. This is going to attract massive moral hazard problems if not regulated strictly.The countries including the US that have high reliance on insurance-based system have hardly been able to regulate the private providers and insurance market.Evidences also show that India till now has not been able to regulate the private healthcare market perfectly on pricing, quality, ethical issues, etc. One can visualize the inflated bill (Rs.18 lakh) for treating dengue fever, or the sad incident of declaring living infant to be dead. As per NFHS-4-2016, the private sector enforces higher share of institutional delivery (40.9%) in C-section as against 11.7% in public facility. The C-section delivery in private sector was 63.9% among insured female. There are enough evidence that suggest unnecessary removal of uteri of thousands of women in private sector in Andhra Pradesh- a state who promoted insurance based financing in 2003. This system will also set rules to establish a level playing field for public and private providers to compete with each other where all providers have to follow the evolving nature of demand. That is, the public, non-profit and for-profit independent hospitals/clinics will be competing on a level playing field. Such competitive market will set some rules for decision-making under which the hospital management has to respond.The public hospitals will largely be responsible for its own financial solvency. Since, objective of public sector is welfare oriented rather than moneymaking, they may suffer with fund crunch (if do not receive enough government support) and may be out of the competition. Under the competitive market, the small providers will not be able to sustain. As, beneficiaries would consider Rs. 5 lakh coverage limit as their paying/purchasing capacity they would be inclined to access care in high quality bigger hospitals rather than in smaller ones where availability of service diversity is low. Therefore, the small hospitals/providers would be just a referral centre for large hospitals. Over a period, one can see a rise of large corporate hospitals in the country with a monopoly of few corporate entities, as has happened in the United State over a period where a chain of only five corporate hospital capture more than ninety percent of the hospital market. Proper regulation of providers, insurers and controlling monopoly power is needed. There is a need to establish institutions such as National Health Insurance Authority (NHIA) at the national level and Nodal and Regulatory agencies across state and districts and all these require huge capital funds. If overall health sector do not get enough budgetary support, the existing institutions may collapse and a new sets of institutions would emerge. The NHIA has to regulate the market on several aspects including premium, pricing, quality, unethical practices, moral hazards issues and so on. That is, NHIA assumed to be a highly competent and efficient purchasing agency especially,to select the qualified providers to contract the services, negotiate with providers for payment methods and price, contract for quality of care. This however depends on market information and accurate information on cost, which is very difficult to get. Overall success would depend on the composition of the NHIA board that would be involved in negotiation contracting, monitoring and evaluation. If private sector, insurer, pharma and medical industry dominate the board, which is expected to be the case, it would certainly influence decision-making power of Ministry of Health and Ministry of Finance. Finally, one needs to see whether existing public system can reduce the health payment burden of household and deliver services better as compared to the insurance driven private sector. A study published in EPW (Hooda, 2017) found some encouraging results. The estimates show high provisioning of public facilities (namely sub-centres, primary health centres, community health centres, sub-divisional hospitals, civil/district hospitals and health personals) in a district/area significantly brings down the overall health payment burden form individual pocket. The public system is even more effective in bringing down the OOP burden when there is no insurance (Figure 4). After rolling out the insurance scheme, the health payment burden on households rather increased. High public provisioning also reduce the catastrophic health payment burden. The households are less likely to fell below the poverty line in areas/districts where public provisioning is higher. Further, the unit cost of hospitalization of uninsured person for major morbidity can be reduced in public system. In private setting, it is higher. Thus, insurance rather than reducing the unit cost increases the unit cost independent of whether services being received either from public or private facility (Figure 5). Indian current primary healthcare system suffers with fund crunch and under-staffing problem, even though performed well in insuring high institutional delivery (66% alone) of child in 2016 (NFHS-4). The access and quality of healthcare can be enhanced by doubling the public spending from its current level of 1.2% of GDP as compared to blindly following the insurance-based healthcare financing system.Currently insurance model also proposes a highly centralized structure where state has to buy 2 lakh coverage (through 40% share in premium) proposed by the centre. Since health is a state subject, states are forced to compromise on their own delivery models of health services. Therefore, insurance based healthcare delivery system is neither economically viable nor politically sustainable.